Quite the contrary, they are designed as a call to action to grab your credit card and spend, spend, spend! When you buy on sale, you usually are saving more but there are other nuances to take into consideration. Saving money isn’t only about buying on sale. You need to educate yourself on how to save money not just on the “large” purchases but on the everyday expenses as well. 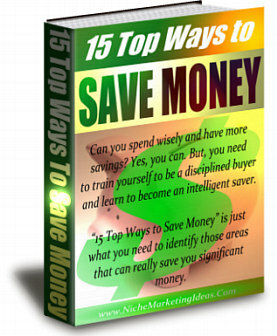 “15 Top Ways to Save Money” takes those into consideration. Taking control of your money and making a commitment to eliminating debt goes hand in hand with “15 Top Ways to Save Money.” Saving money on future purchases goes hand in hand with knowing where you haven’t saved in the past. There is no reason to continue paying top dollar for items that you need when there are alternatives. Saving money on everything you purchase allows you to invest additional money each month. Start with a good budget that cuts out unnecessary spending and reduces your expenses so you can save more each month. Even if you save just $20 per month that’s over $200 that you wouldn’t available otherwise! Put that $240 into your savings account or use it for another budgetary item. Every dollar you save helps bring your budget into balance. Helps you live within your means. Don’t spend more than you have. It doesn’t get any more basic! 1. Is this item something I really need? 2. Do I already have one of these items? 3. How many hours of pay is this item worth? The answers to these questions and more are available at the click of your mouse at ’15 Top Ways to Save Money.’ Good Luck and Success! You Deserve It!